On our first date, the waitress had to come to the table at least three times before Ryan and I were ready to order. It wasn't menu indecisiveness; rather, we were too busy chatting away (read: me, grilling him with questions) to even look at the menu. When we finally ordered, Ryan selected the eggplant parmesan and thus was my first introduction to the funny-looking vegetable. I don't cook with eggplant all that often, which is surprising because after discovering it, I found that I really enjoy it. I know it's kind of a 'love it or hate it' vegetable for many, and I can understand why. Incorrectly cooked, it can be bitter or mushy or flavorless. 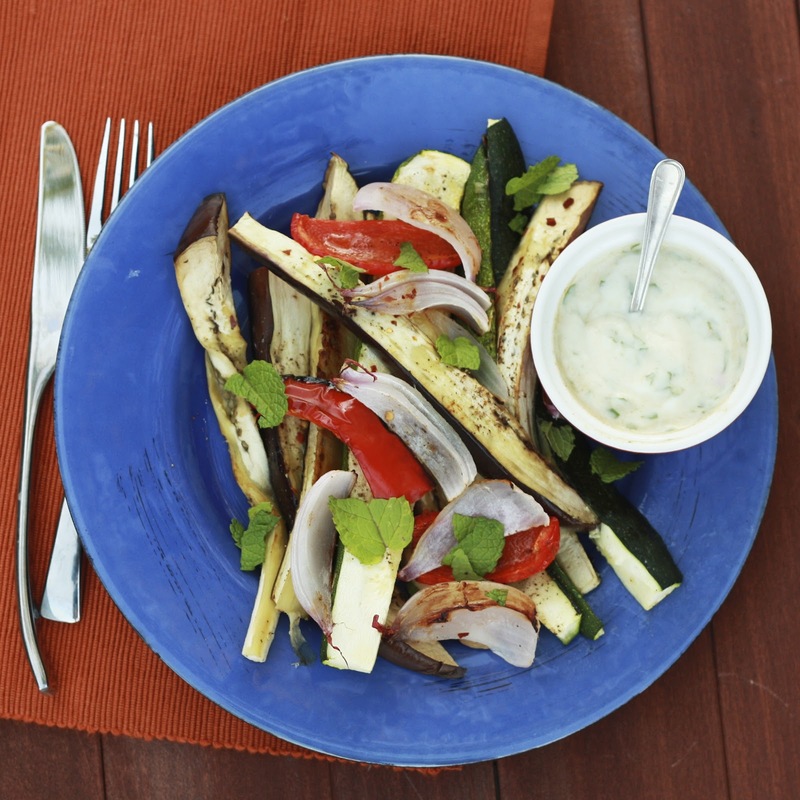 Not so in this roasted vegetable salad, found in Redbook's October issue. This was another post-vacation detox meal when we were craving anything that wasn't cheese or bread! I'm already craving this again. The vegetables are tossed with salt, pepper, and red pepper flakes. 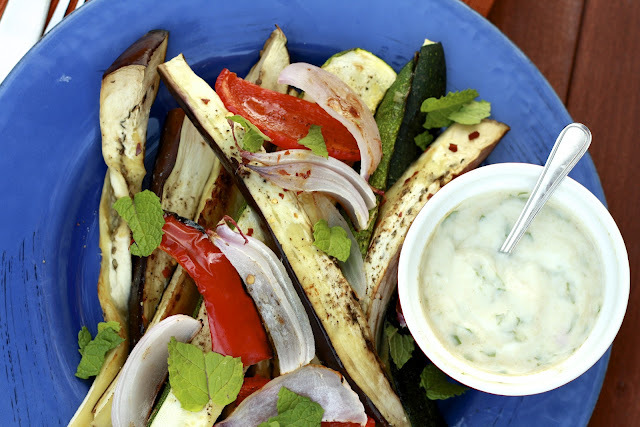 The simplicity of the seasoning lets the fresh flavors from the veggies shine, and the mint yogurt sauce is the perfect cooling mechanism to counter the red pepper flakes! The recipe calls for topping the salad with toasted pine nuts, which I accidentally forgot to include. We didn't miss them but they'd be a great addition! The winner of the Stonyfield Frozen Yogurt giveaway is Shannon, picked via random number generator, whose weekend plans included dogsitting! Shannon, email me at natalie@thesweetslife.com so I can get you your frozen yogurt! 1. Place two oven racks in oven to divide into thirds. Preheat oven to 425F. 2. Line two baking sheets with aluminum foil. Place eggplant and onions on one baking sheet and bell peppers and zucchini on the other baking sheet. 3. 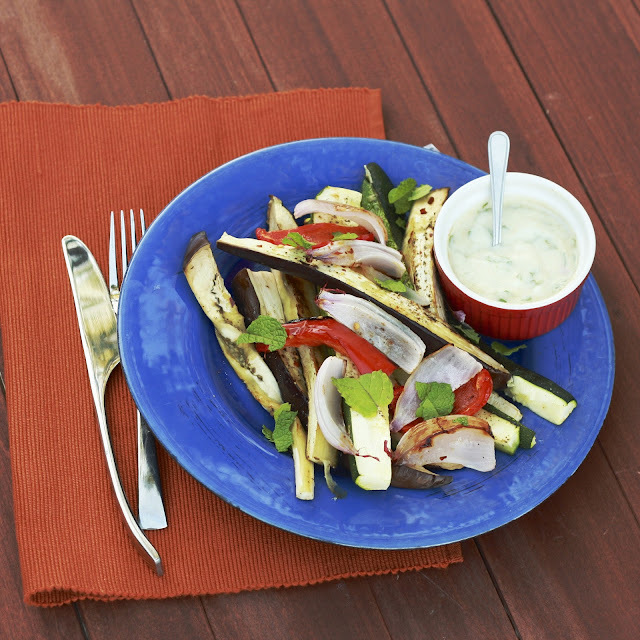 Drizzle the eggplant with 3 tbsp oil and sprinkle with 1/2 tsp of the salt and 1/4 tsp each of the black pepper and the red pepper flakes. Toss to coat and spread vegetables in a single layer. Repeat with the peppers and zucchini, using the remaining oil, salt, pepper, and red pepper flakes. 4. Roast eggplant and onions for 10-15 minutes. Put peppers and zucchini on the other rack and roast for 30 minutes, until vegetables are tender and lightly charred (about 30 minutes). 5. To make the dressing, combine all ingredients in a small bowl and stir to combine. 6. Sprinkle vegetables with pine nuts and mint before serving warm with dressing on the side.